Your nose is the most prominent feature of your face and it is possible to modify the shape and size of the nose if you feel self-conscious about the appearance of your nose. The operation is called Rhinoplasty, colloquially known known as a 'nose-job'. There are a combination of changes which can be made to improve the appearance of the nose which include reshaping the bridge of the nose (usually reducing a hump), refining the tip of the nose, improving the projection of the tip, shortening the nose or narrowing wide nostrils. The aim is to shape the nose so that it is in balance with the proportions of the face. Rhinoplasty is typically carried out under general anaesthetic and you can go home on the day of surgery. Sometimes a single night in hospital is advised. The shape of the nose is determined by a framework of cartilages and bones. Small cuts are made inside the nostrils to access the framework and reshape it. Sometimes it is also necessary to have a small scar at the base of the nostrils or across the central strut 'columella' of the nose. The operation takes about 90 minutes. At the end of the operation a small splint and some tapes will be positioned and packs are inserted into the nostrils. This is done to support the new shape of the nose while it sets. The nostril packs are usually removed before you leave hospital but may be left for a week if extensive internal work is done. Some moderate pain is expected for 3 - 5 days. There will be some bruising around the eyes for a couple of weeks. You should have a quiet week resting at home after surgery. You will have a clinic check-up at 1 week and the splint is removed from the nose. You can return to normal daily activities after 1 week but avoid vigourous exercise / activity for 6 weeks including any contact sports to allow full healing of the nose. You should avoid blowing your nose for 2 weeks. 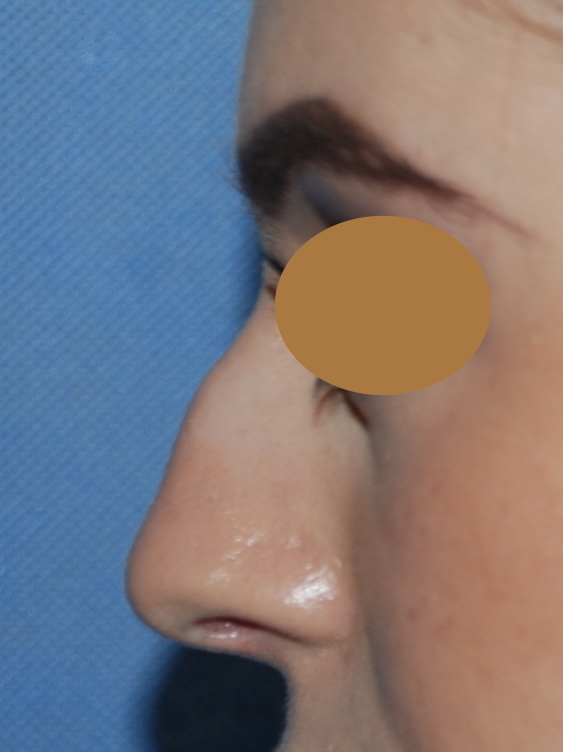 Do I have to have rhinoplasty if i want to change the shape of my nose? The shape of the nose can also be altered by injecting dermal fillers. 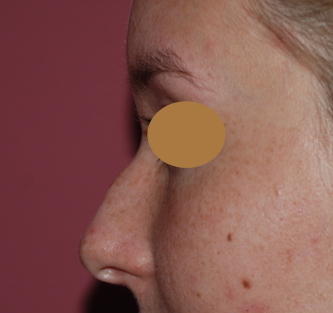 This can be effective in altering or disguising the contour of the nose without resorting to surgery. Fillers are not permanent and this may be an advantage for patients who are not so sure about having the nose permanently reshaped. 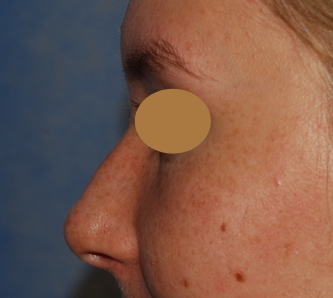 What problems can occur with Rhinoplasty Surgery? It is impossible to eradicate all risks from surgery but serious surgical and anaesthetic complications are very uncommon. Patients are not quite sure what to expect and, after surgery, may perceive subtle irregularities which are only visible to very close observation but which would not be apparent during normal social interactions. The final shape of the nose is not achieved for approximately 18 months because swelling and symptoms associated with the surgery take many months to completely subside. Understandably, this can be a source of anxiety. More noticeable irregularities do occur following surgery because healing of reshaped bones and cartilages is not entirely predictable. In about 5% of cases this may require revision surgery or nonsurgical treatment. Bleeding can occur after surgery and usually responds to dressings and pressure but rarely (<1%) a return to the operating theatre is required. Infection is infrequent (<1%) and is treated with a course of appropriate antibiotics. Hypertrophic or keloid scarring is also rare and this can be addressed with some specific treatments to reduce the scarring. There is bruising around the nose and eyes which takes 2 weeks to resolve. 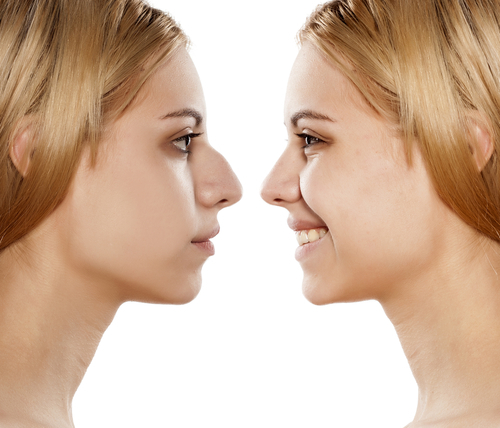 Altered sense of smell is common after rhinoplasty and typically resolves after 6 - 8 weeks. The nose may be stuffy for 6 - 12 months following surgery until the linings of the nose settle down. Some patients report dryness of the nose and others find the nose can be a bit runny during these initial months. Nasal sprays can be helpful. 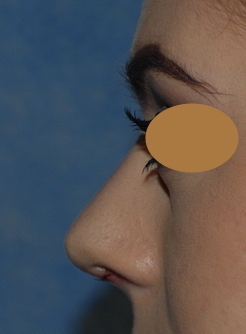 Am I the ideal patient for Rhinoplasty Surgery? If you would like to improve your nose to achieve achieve an aesthetically balanced nose which is in proportion to your face, for example reducing a hump or refining a heavy nose, then Rhinoplasty surgery is right for you. It is possible to correct deformities resulting from an injury or with which you were born or developed in adulthood. You should be realistic as to what can be achieved by Rhinoplasty Surgery and understand the risks and side effects of this surgery. If you have very thin or very thick skin on the nose, the surgical results of rhinoplasty are much less easy to predict and very subtle refinements can be less easy to satisfactorily resolve with this surgery. 1 week after rhinoplasty to reduce a small dorsal hump and refine the tip of the nose. 2 weeks after open rhinoplasty. The contour of the nose has been sympathetically improved without 'over correcting'.